miss seeing that big No 42 on the field on Saturdays. I remember in 2015 watching this freakish athlete return a blocked extra point the length of the field for a safety. He was on my "dream team" of recruits. Never in a million years did I think Clemson would land this super-talented young man. I have enjoyed watching this high-octane Tiger wreak havoc on opposing offenses. This great leader has fun on and off the field. I will miss that mischievous smile (you KNOW he is up to something). And who can ever forget those dancing Power Ranger antics during the game. Just when it seems like there are no heroes or role models in today's social media frenzied world, you just have to take one look at Mr. Christian Wilkins. There, you will see the type of man that you and your children can look up to; the kind of man you'd love to have as a friend, a neighbor, a co-worker, or a leader in your community. Thank you Christian for your consistency, your positive energy, and for all that you have given to Clemson University. of your team. There will be a leadership void next season. There will be leaders, but they won't be Christian. This is one of the things that makes college football so great. From one year to the next, each team is different. Next year's team will need some great leadership to step up. No matter what, though, it won't be the same without CW. He's soon to be a multi millionaire and his life will be so changed. 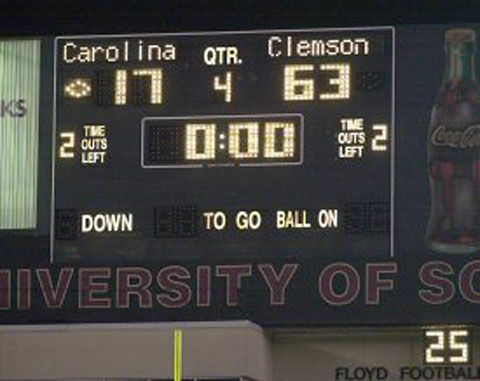 Hope he remembers the good times at Clemson and comes back often. Agree. This has been such a fun team to watch. They love the sport and they love each other. And - they love Clemson University. I agree it's hard to replace leadership on a great team but I have noticed that Dabo and staff seem to extract this from the team every year. When Big Ben Boulware left I just knew we would miss that fire and leadership but ok CW42 just fell right in as the voice of the team per se. I don't know who that will be next year but I think XT, KJ and TLAW all will shine as a vocal leader in their 3-4yrs. Only when there is a chance of snow ?????? We've been blessed with many great players...Spiller, Boyd, Watkins, Nuk, DW4, Williams...but # 42 deserves a statue! at least two more times in their careers. He is a great athhete and a jolly old elf. A guy who has fun in all situations, I envy him because I can't get by the humdrum and stress of every day. I will miss him big time. Wish him well for all his great perfomances and sportsmanship. It would have been easy for the season to go south if there had been shisms over KB's leaving. He bought KL breakfast and thought first of team. Bless him, Go forth and have fun in the NFL my man! Thank you! This is awesome. Nice work!! ...a tragedy as a kid create a dark hole in him and turn on the world. Instead he "let his light shine" (as Dabo says) and enhanced his athletic ability with a joyful attitude. Christina and Dabo's version of Clemson are a perfect match!